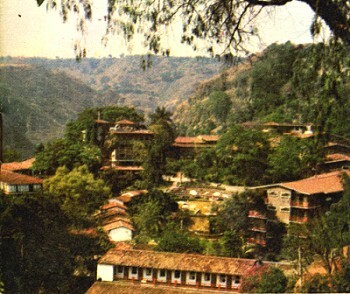 In its day, the San José Purua spa-hotel in Michoacán was world-famous. Opened in the early 1940s, it was the epitome of luxury living. European chefs cooked for the guests. Cabaret and touring acts from all over the world performed in its small night club. An on-site bowling alley provided some entertainment for the younger set. The hotel’s popularity led to the access road, complete with its “La Curva de la Gringa“, being paved for the first time in the mid 1940s. One writer mentions that he saw cars with license plates from no fewer than eight different countries in the hotel’s car park—all at the same time! Sadly, the San José Purua hotel ran into ownership and management problems and is now but a poor shadow of its former self, though the grounds and pools can still be admired. Several attempts have been made to relaunch the hotel as a luxury resort, but so far none has succeeded. If you want to overnight or vacation in this magnificent part of Mexico, the best place by far is slightly further down the valley, at the Agua Blanca Canyon Resort, a charming, small hotel with just 20 rooms set in stunning scenery, with its lawns overlooking the deeply carved valley of the River Tuxpan. This is a geographer’s delight! Waterfalls, rock formations, the meanders of the Tuxpan River, steep canyon slopes… what more could one want? This was one of the first locations in Mexico where high school students were actively engaged in geography fieldwork investigations thirty years ago. In February 2010, a short distance upstream, the Tuxpan River burst its banks flooding the town of Tuxpan and other nearby settlements in Michoacán. This is also the region where director John Huston filmed parts of “The Treasure of the Sierra Madre“, starring Humphrey Bogart, in 1947 (he used the San José Purua hotel as his base), but that’s a whole other story. Michoacán – post amended to make this clear! Thanks! I used to spend wonderful times searching for fossil rocks on the nearby underground river entrance and watch the monarch butterfly. Also near the place there are several places to visit like Paracho , and the beautiful park where the Rodilla del Diablo is [in Uruapan].